Travel through any neighborhood in Australia and you are almost certain to come across any number of homes constructed from fibro asbestos sheeting — many in bad shape. These ticking time bombs are a stark reminder of Australia’s love affair with asbestos from the 1950s through the 1980s. During this time, according to the experts, Australia had the highest per capita use of asbestos in the world. Deemed a miracle product of the time because of its high tensile strength and thermal tolerance, asbestos was extensively used by the building industry in the production of a wide range of products. The deadly nature of asbestos is known throughout Australia, yet there are those who continue to act irresponsibly around buildings known to contain it. Anyone who cuts into, breaks down or otherwise demolishes fibro asbestos walls can release the toxic asbestos fibers within. Once released into the air, the microscopic fibers can be inhaled, where they have the potential to cause asbestos-related diseases many years later. 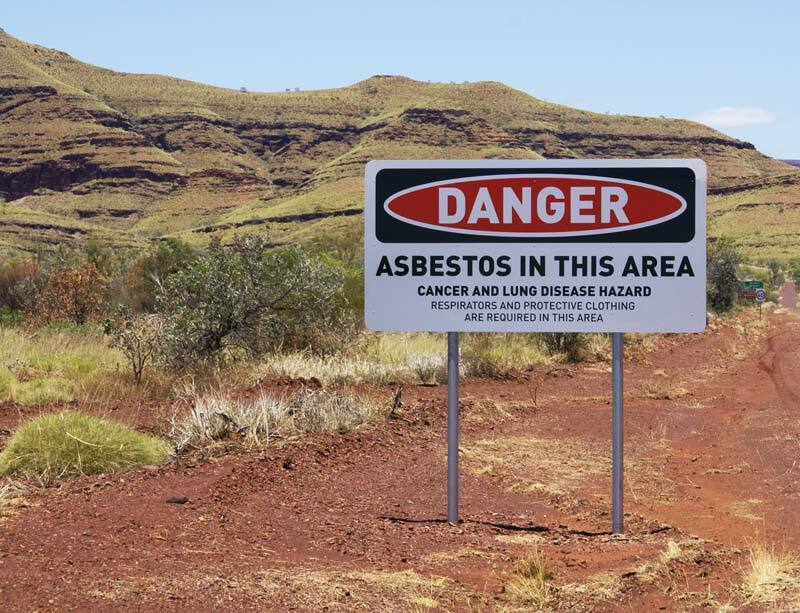 I know firsthand what asbestos can do, having witnessed my husband Brian suffer and die from mesothelioma after exposure in the infamous mining town of Wittenoom. I now fear asbestos and have become uncomfortably aware of the number of fibro asbestos homes, buildings and fences that exist around me. Often, when driving through my neighborhood, I see broken walls and fences with friable asbestos open to the elements — and I am glad my car windows are closed. Whenever possible, I will not go near homes built from fibro asbestos sheeting, and I certainly would never live in one. But I know this alone cannot protect me from harm. Someone nearby may be pulling down an old shed or bashing down a fibro asbestos wall in their home. These and a number of other acts can release deadly asbestos fibers into the air I breathe. It’s a frightening reality but one that faces all us here in Australia and around the world. Like it or not, asbestos is indestructible and here to stay. Our hope of eliminating asbestos-related illnesses and deaths rely on each us acting responsibly around it. At no time should we attempt to cause damage to any home, business, backyard shed or fence that is known to contain asbestos. There are dedicated asbestos removal companies who can safely do this for us. But what about the asbestos we can’t see? Recently, residents in Sydney were shocked to discover they were living on top of James Hardie asbestos disposal sites. Residents of at least 185 homes considered to be at “high priority risk,” were warned not to dig in the garden or mow their lawns. Tragically, the advice has come too late for the families who have lived, worked and played on the land for most of their lives. The Chaouk family from Granville, Australia, lived on their property for 28 years without once being warned of contamination. They first learned the distressing news when contacted by Fairfax Media after a reporter saw the family’s address on a government report. Ali Chaouk and his sister Manaya recall eating fresh produce from the vegetable garden in their back yard over the years. Known affectionately as “the little sanctuary,” the garden is still tended by their ageing parents. The Environmental Protection Authority (EPA) of New South Wales has been working with affected properties to manage any contamination where James Hardie asbestos waste may have been disposed over the past 30 years. Under the guidance of the Heads of Asbestos Coordination Authorities, the EPA is working alongside the City of Parramatta Council and other state government authorities to reassess the risk of contamination at properties around the Parramatta local government area. In August 2017,the reassessment process entered a sampling phase. Residential properties and public land identified as being in the immediate vicinity of disposal sites (according to historical records) were sampled. Results of the sampling were used to determine the extent of asbestos contamination and to develop a governmental approach to manage the issue. Since November 2017, the EPA has been working with affected property owners to manage any contamination. Environmental Protection Authority of New South Wales. (2018, March 5). James Hardie asbestos waste contamination legacy. SafeWork NSW. (2017, May 15). James Hardie Legacy Contamination Sites.